IntroductionWe reviewed the senior aurthor’s experience of 100 consecutive cases of supermicrosurgical lymphaticovenular anastomosis (LVA) for treatment of extremity lymphedema and assessed the procedure’s efficacy, limitation, indications, and contraindications. We also described the technical strategies and maneuvers developed as a result of this experience. Method100 consecutive cases of extremity lymphedema treated with LVA were recruited into the study. 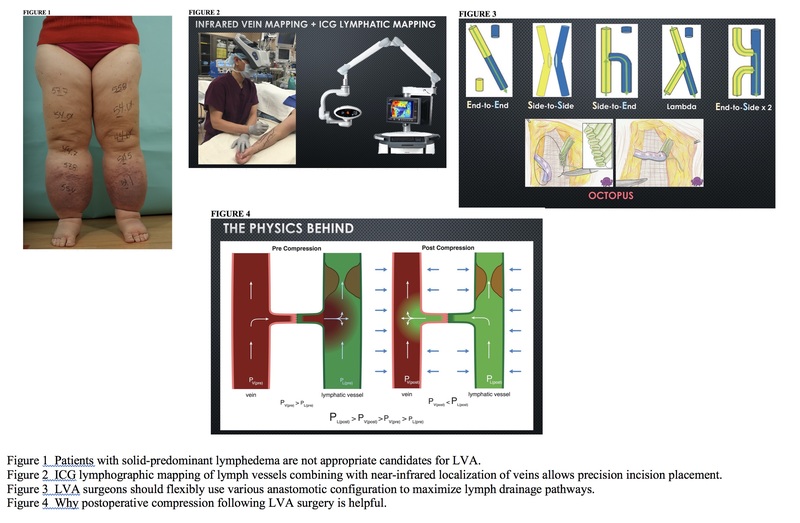 Patients were evaluated with self-assessment, circumference measurement, quality of life assessment (LYMQOL), bioimpedance spectroscopy (BIS), and indocyanine green (ICG) lymphography at preoperative visit, 3-month, 6-month, and 12-month postoperative visits. Result59 upper extremities and 41 lower extremities were treated. Disease severity ranged from Campisi I to IV. 94% reported relief of symptoms (reduction of edema, pain, rigidity, and paresthesia). 77% demonstrated limb volume reduction. 79% (69 of 87) showed improvement in quality of life on LYMQOL. 70% (45 of 64) had confirmed edema reduction on BIS. ICG lymphography demonstrated favorable lymphographic changes in 84% (67/79). All patients had improvement demonstrable in at least one tracking modality. Postoperative improvements were observed promptly following surgery and continued for six months in majority of the patients (93%, or 81 of 87). In 7% (6 of 87) of the patients, the improvements continued and stabilized at one-year postoperatively. ConclusionWith proper patient selection and technical execution, supermicrosurgical LVA is an efficacious treatment for extremity lymphedema.